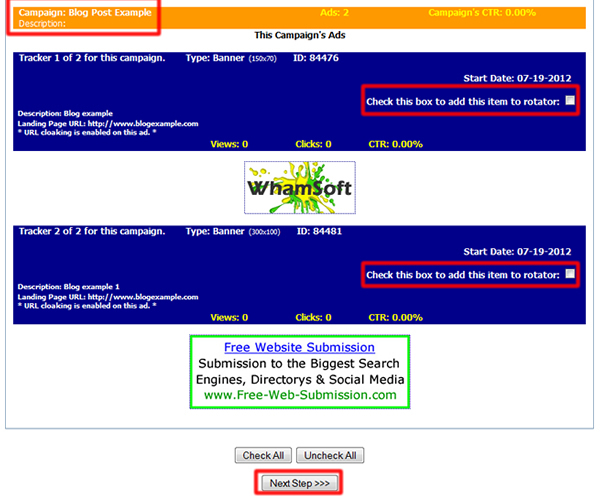 From the starting page you’ll get a good overview of your current banner campaigns. 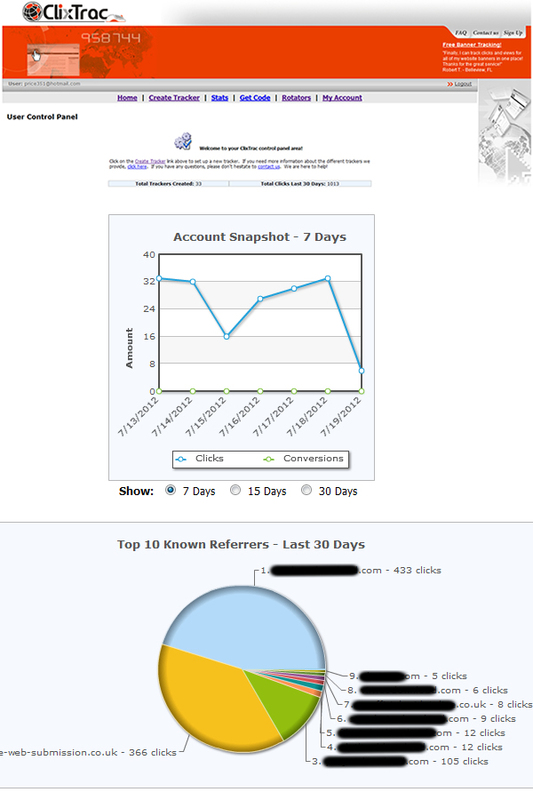 It has three main sections: Account snap shot (line graph showing daily clicks), Top 10 Referers (pie chart showing click from each referring site) and current campaigns. 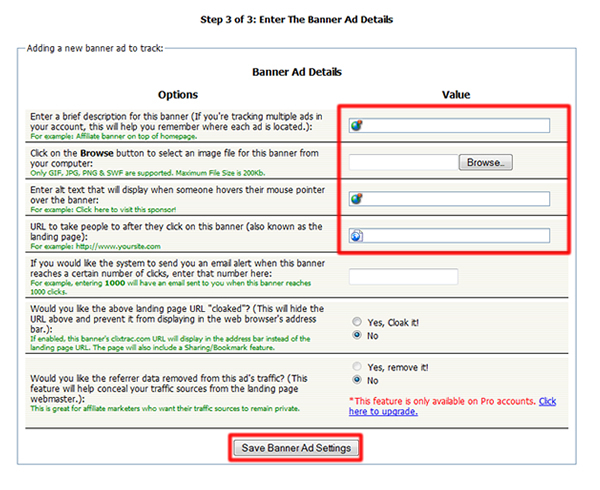 Creating a banner tracking code or banner rotator is very simple, though initailly I did get confused by the setup. I’ll explain everything you need to know here so you won’t have any issues when you create your campaigns and rotators. Start by clicking Create Tracker from the top menu. Now enter a name into the new campaign name box. A good name would be something like Sitename + Page Location, you can leave the description blank or add more details if you wish. Click the next step button. Now you need to choose the type of tracker you want to setup. Click the Banner Ad button. Now enter the details of the banner itself. The most important parts are the first four boxes, Description, banner location (browse files from your computer), Landing page url. You can also choose to cloak this link if you prefer. Click Save Banner Ad Settings. You can use this code to display a single banner on your website and track its impressions and the amount of clicks it recieves. If you want to create a campaign that rotates two or more banners you’ll need to setup the initial campaign and first banner as above. Then follow the steps below, and this will create your banner rotating code. 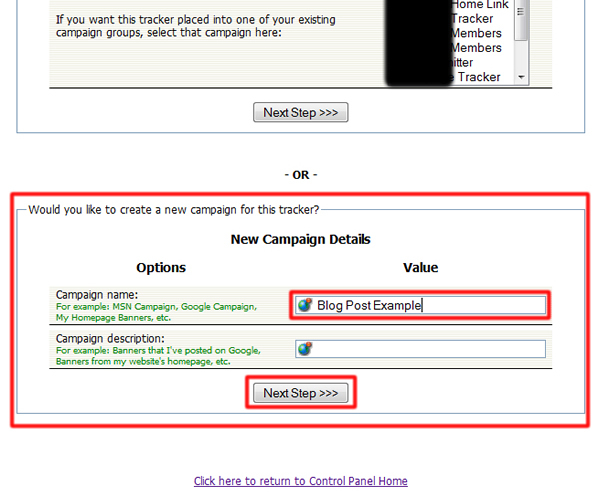 Click Create Tracker at the top of the Clixtrac page, then select your existing campaign (the one you created above) and click the next step button. Click the Setup Banner Ad button. Enter the details of your second banner (same process as above). Click Save Ad Button. You’ll now be shown some new code – DON’T USE THIS CODE, this code will only display one of your banners. We now need to create a rotator to complete the setup. Click Rotators from the top menu. Enter a name into the Rotator Name box from within the New Rotator Details Box (I normally choose the same name as my campaign). You can leave the description box blank and then click the next step button to continue. You’ll now see a page showing all your campaigns and your banner within each campaign. Click the check box on the right side of each banner to add your banners into your rotator code. Each of your banners should be under the same campaign. Click the next step button. You should now see your rotator code and it will look like this. Apply this code into your websites html and it will rotate your banners on a even basis and track the clicks and impressions the banners recieve. You can view the banners performance from the Clixtrac Home Page and select view on the campaign you created. It is very good I like it. This can be helpful and useful at clickntake.com : something for everyone ! From what I’ve read sounds pretty good! Definitely, this is an awesome post. Webmasters can make use of it.